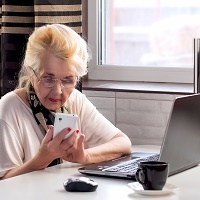 Becoming a victim to fraud – Seniors are often targeted by scammers. The FBI lists a few tips on how to protect yourself at http://www.fbi.gov/scams-safety/fraud/seniors. Medicare misconceptions – Some seniors think that once they qualify for Medicare, there will be no gaps in coverage. But in fact there may be. For instance Medicare does not cover nursing homes and assisted living for long-term care. Becoming too conservative – An asset allocation that is overweight in bonds and cash might not generate enough long-term income from the portfolio. Your investment portfolio should be aligned with your financial savings goals, needs, and risk appetite. We also see some retirees make the critical mistake of not factoring the effects of inflation into their financial plan. Cost expectations – In addition to not adjusting expenses to match retirement income, we find that some seniors also underestimate the cost of a serious illness. Another common mistake we see is that some seniors think a large house and/or a house in an expensive area will be affordable for them forever. It could be affordable now, but compounding the cost over 30-40 years may not be sustainable. Not planning for potential incapacity – While most people do have estate planning documents outlining how they want their property to be handled after death, we find that many seniors do not address how they want health care and property decisions handled in the case of incapacity. Incapacity can result from a serious injury, a stroke, or dementia for instance; a will does not address this situation. Too much money in tax deferred accounts – When planning for retirement, we find that people take advantage of utilizing tax deferred accounts to save for retirement. When retirees are forced to take required minimum distributions from these accounts, it is often anticipated they will be taxed at a lower tax bracket than when they were working. However, this is not always the case, and those withdrawals may be subject to high ordinary income tax rates. . Drawing from retirement accounts too soon – Again, we recommend examining your financial situation and tax bracket. Withdrawing money from your retirement accounts too soon or too late can both significantly impact your savings. Familiarizing yourself with the retirement account rules can help you extract the most value from your assets. Canceling life insurance too early or carrying it too long – It would be prudent to assess your life insurance needs and current premiums to determine what is appropriate for you. Becoming the bank for your kids or grandkids – Many seniors want to help their children or grandkids in some fashion, but we’ve also seen some extreme examples of gifting that proved to be detrimental to the seniors’ financial plan. Relying on annuities – Whether or not an annuity is right for you depends on your specific financial situation. We find that for some, annuities can be appropriate while for others, they can be unsuitable. We recommend an in-depth assessment of the product and your overall financial plan. Ignoring Roth IRA conversion opportunities – It may be worth exploring a post-retirement Roth conversion as many retirees have a longer life expectancy than they originally expect. We recommend checking your tax bracket and assessing also the size of the potential conversion. No longer contributing to a retirement plan – Most people do not contribute to a retirement plan during retirement, but it can make sense for those still earning income. This is because continuing to fund an IRA on a tax-deferred basis means more money may be available later in retirement. Modera Wealth Management, LLC ("Modera") is an SEC registered investment adviser with offices in Boston, Massachusetts, Atlanta, Georgia, Hernando, Florida, and Westwood, New Jersey. SEC registration does not imply any level of skill or training. Modera and its representatives are in compliance with the current registration and notice filing requirements imposed upon SEC registered investment advisers by those states in which Modera maintains clients. Modera may only transact business in those states in which it is registered/notice filed or qualifies for an exemption or exclusion from registration/notice filing requirements. For additional information about Modera, including its registration status, fees and services and/or a copy of our Form ADV disclosure statement, please contact Modera or refer to the Investment Adviser Public Disclosure Web site (www.adviserinfo.sec.gov). A full description of the firm's business operations and service offerings is contained in our Disclosure Brochure which appears as Part 2A of Form ADV. This article is limited to the dissemination of general information regarding Modera's financial planning and investment advisory services to United States residents residing in states where providing such information is not prohibited by applicable law. Such general information is not suitable for everyone. Accordingly, this email should not be construed by any consumer and/or prospective client as a solicitation to effect, or attempt to effect, transactions in securities or as the rendering of personalized investment or financial planning advice for compensation. Nothing contained herein should be interpreted as legal, tax or accounting advice, nor should it be construed as personalized financial planning, investment or other advice. You should contact your tax advisor, accountant and/or attorney before making any decisions with tax, accounting or legal implications. Past performance is no guarantee of future results.